Click HERE to register or email to inquire. This is gonna be your favorite night of the week! Join our small class of fun friendly pals for relaxing creative times. This is a hand-building class where the possibilities are endless. Make anything from your own favorite mug to a work of true sculptural genius. Some people think the pottery wheel is where it’s at, and there will be a chance to try it out if you like. Hand-building is for everyone and any level, so leave your worries behind and come make something you’ll be proud of. These classes take place at my studio—4277 Fraser street (alley entrance). These classes are chock-a-block with fun and creativity. Listen to good tunes, relax with new friends, make ANYTHING you care to dream of--toys, buddies, dishes for your favorite snacks and drinks, spoons for your ice-cream sundaes, gifts for the incredible people in your life, important plaques for your walls, giraffe coat-hooks, wacky plant trophy cups, you know, anything! These classes take place at my studio--4277 Fraser street (alley entrance). Want to celebrate a special event or just have some fun with friends? 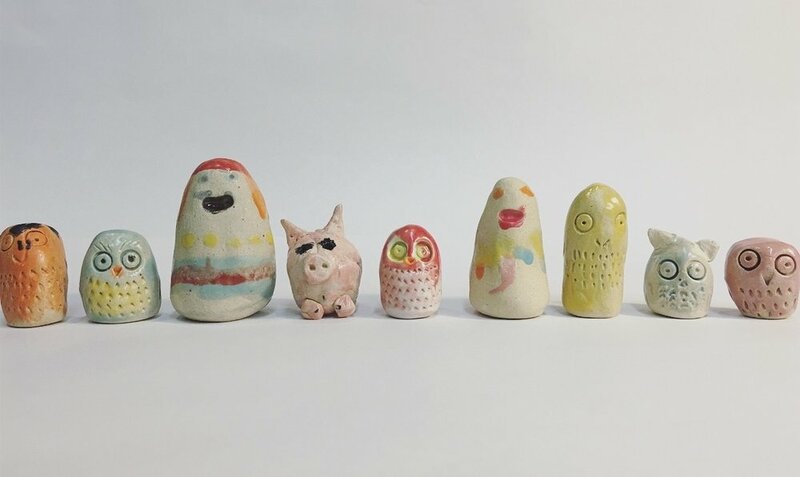 These clay parties are a super way to entertain kids or adults. Plan your kids birthday and include some creativity—they can make something memorable and the other kids can bring home something more exciting than a goody-bag. OR have team building night with co-workers, a bonding night with some friends, or celebrate a birthday with some clay fun! These parties can be hosted at my studio (4277 Fraser st) or in your home. Have the party at your place and I’ll bring all the materials, set up/ take down for you. Have it at my studio and relax in a fun art space—it’s up to you! Max 6 individuals. We will make one project and use special colored glazes that can be applied to wet clay. Then I’ll fire them in my kiln and you can pick up 7-10 days later. All items are made with food safe materials. $180 for kids 1 hour parties (6 kids max). Email to inquire, ask any questions, arrange details and book your date.